I’ve been in a crochet funk for the past couple of days. Instead of actually crocheting, I found myself going around in circles about what pattern to start and which yarn to use. So I -gasp- took a break from yarn. It’s been an interesting change of pace, but now I’m back with a fresh mind and a new dishcloth! 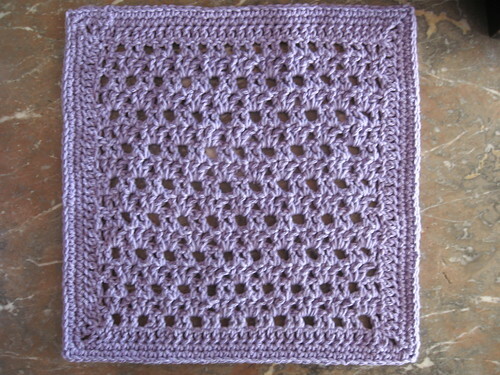 This is the Double Trouble Dishcloth, made with Sugar ‘n Cream in Hot Purple. With four different rows, the pattern stitch was entertaining enough without being difficult. 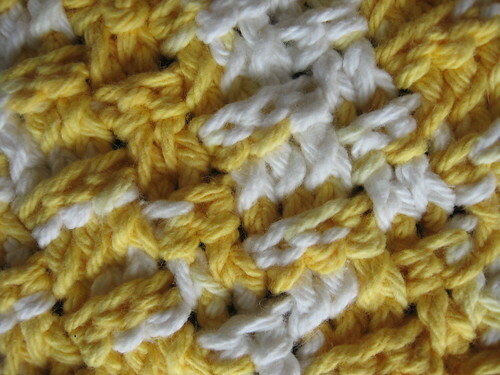 I added a couple single crochet rounds to the border to square off the dishcloth. 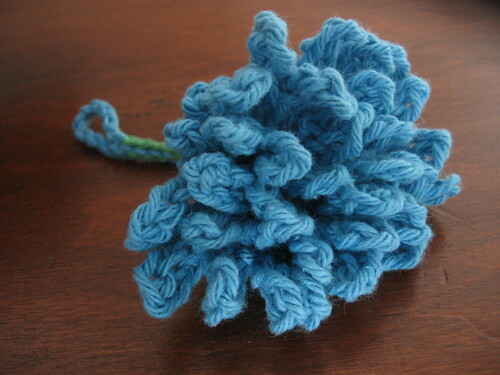 In hindsight, a simple shell border or even a picot stitch would have been a better option. The whole FO is on the large side. 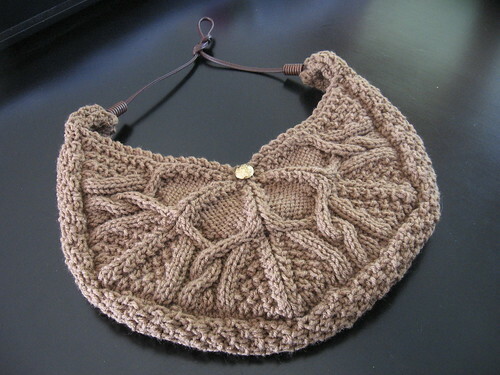 If I crocheted this pattern again I would use a smaller hook size to get a firmer fabric. The shells feel a little loose, but since no gauge is given I can’t say for sure if the designer intended for the dishcloth to be more compact. 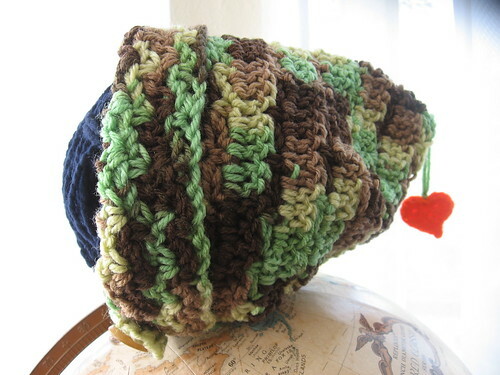 The Origami Hot Pad is a fast crochet pattern that makes a sturdy and practical hot pad. 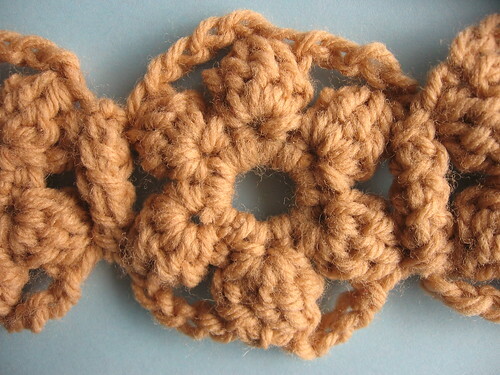 This is the type of pattern that makes a great mindless project, since it is made completely of single crochet. I used Sugar ‘n Cream in Hot Green and Key Lime Pie. 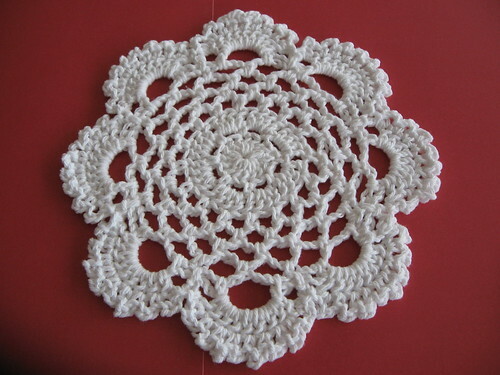 The hot pad is started with a chain of thirty-five and made by crocheting continuously in rounds. By folding the resulting pouch, the ends meet and you get a double thickness hot pad. I’ve seen other versions that have a little loop added to hang. I’d love to make more of these with lots of coordinating stripes. Today I fiddled with the Framer function on Big Huge Labs. There were a lot of tempting options, but I settled on the ‘brushed edge’ for this photo. The pink butterfly is from the corner of the rain cloud picture I posted on Easter. 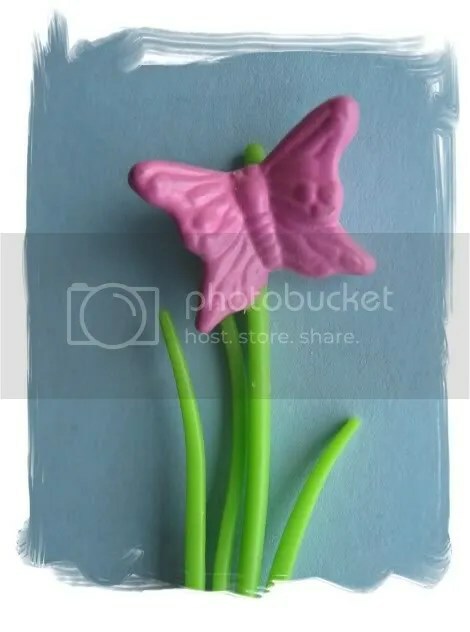 What looks like a flower is actually a tiny pink butterfly sitting on a blade of grass. Whenever you see a photo mosaic here on A Whole Load of Craft, you can bet it’s a product of Big Huge Labs. There’s so many options I could never fully explore each one, but I’m a fan of the mosaic functions. You can cram a lot of photos into one cohesive picture. The Big Book of Dishcloths by Leisure Arts is something I’ve wanted to buy after seeing Mellissa’s pretty dishcloths on her blog The Adventures of Wondermommy. Wouldn’t you know, I was off-island yesterday and found it on a rack at Goodwill for $2? It was a nice little surprise on a busy, errand-filled day. Some may not like the black and white photos inside the actual booklet, but I found myself admiring several different patterns. 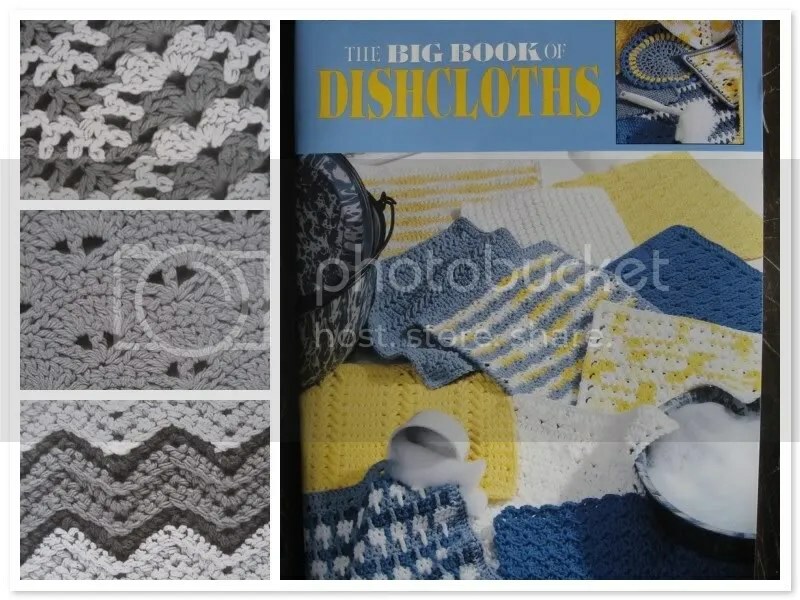 Not only are there some interesting dishcloth patterns, this book doubles as a stitch library of sorts. 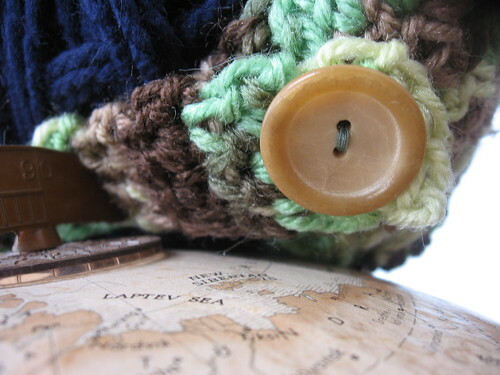 There are a number of interesting and unique stitch patterns. 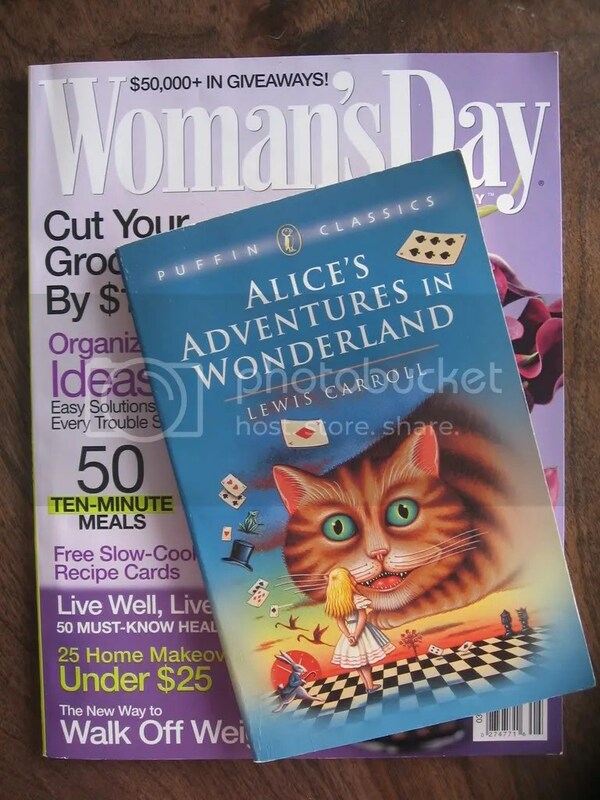 This booklet is a great resource for crocheters and relatively cheap, even at the regular price of $7.95. Stay tuned for actual finished objects in the near future, including some toddler-sized slippers! I have more than enough WIPs and computer upkeep to keep me busy, but I just couldn’t resist a few little projects. They are entertaining until all those little ends catch up with you! 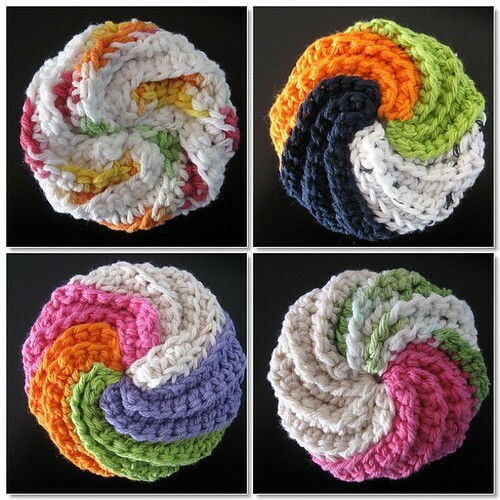 Hopefully people are managing with the error in color scheme for the Through Any Window Baby Blanket Tutorial. The corrected tutorial is slowly coming together. 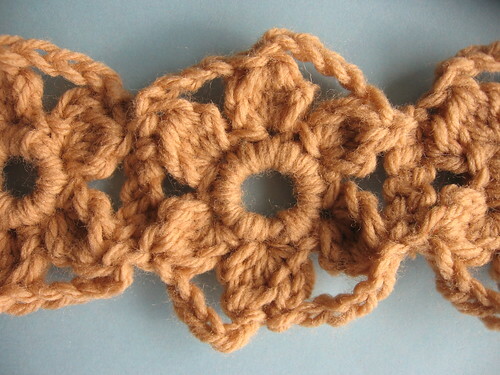 This tan Crochet Headband, below, consists of a few easily crocheted flowers. The pattern calls for four motifs, but I threw in one more as a tiny bit of procrastination. Since each motif was made individually, all those loose ends were no fun. The pattern directs you to leave a ten inch tail when you finish off, which is then used to connect the motifs. 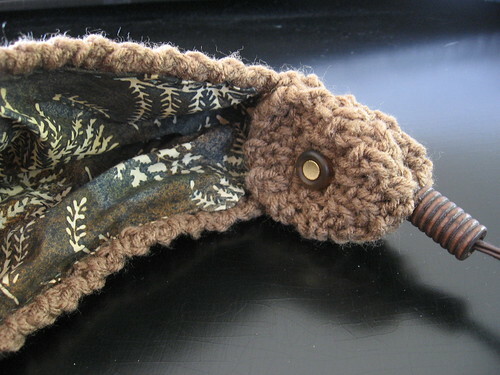 Next time I crochet this headband I would just slip stitch across a ch-5 loop for a quicker, join-as-you-go assembly. Just like the Elizabeth headband I made last Christmas, the wrong side almost makes this headband reversible. 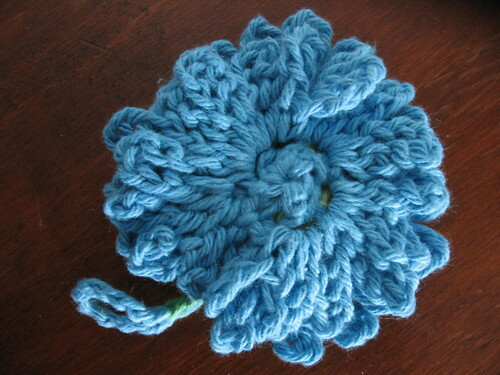 Each flower petal is a cluster of double crochet stitches which bulge on the bottom side. 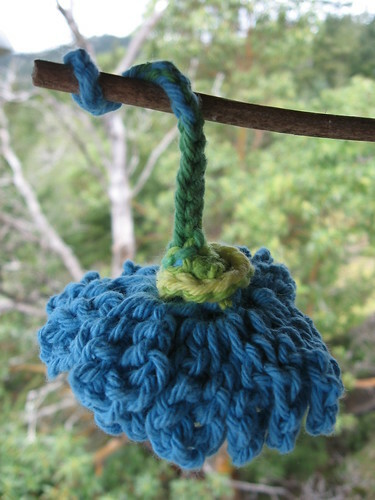 Mandi of On Hooks and Needles made a pretty green cotton version back in May 2007. 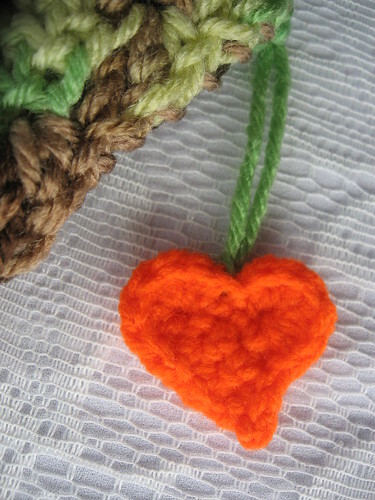 Mine is made of some scrap Red Heart Super Saver in Cashmere. Andrea’s “Woven” Dishcloth gives the stitch multiple so you can easily customize the dishcloth size. I used a starting chain of twenty-six with a size F hook. 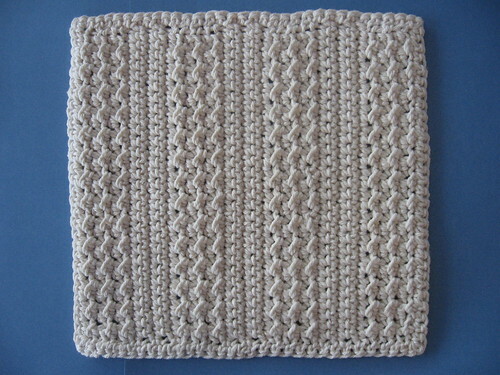 The actual dishcloth measures 6″x 6″. 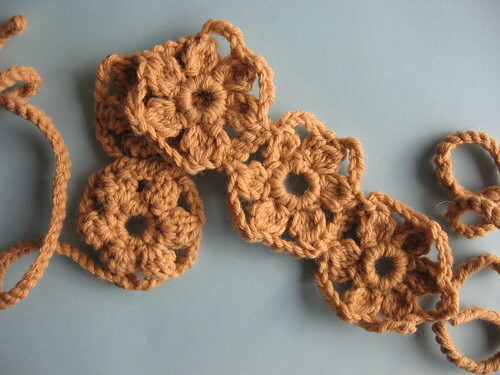 I also replaced the double crochet stitches in Row 1 for half double crochet stitches. 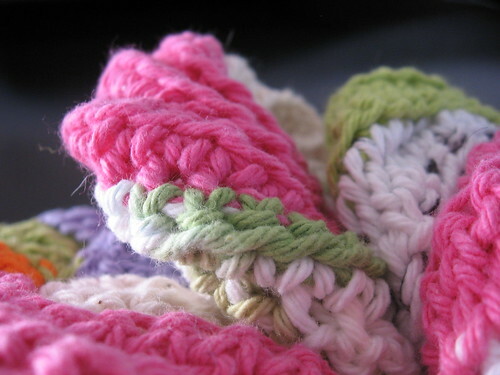 This dishcloth packs a lot of cotton in a little square. Back and front post stitches are alternated in each row with a tight gauge. This results in a tough, durable structure and a nice, bumpy texture. Andrea has a blog contest running until 2pm CT, March 23rd. 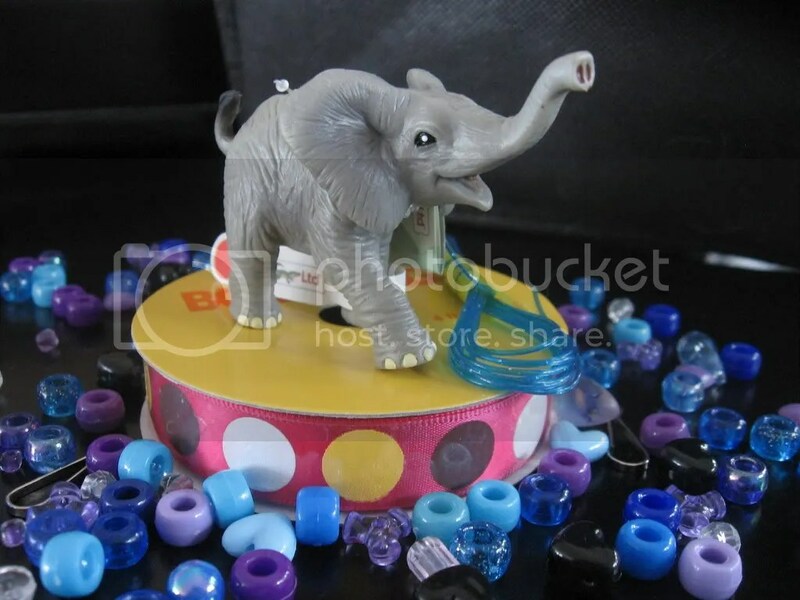 To enter the contest, make up the mystery pattern and e-mail her a description and/or picture. Even if you can’t participate, check out her blog after the deadline to vote for the best entry! Also, check out her review of A Whole Load of Craft along with a short interview about my crafty beginnings. The Pink and White Lady Slipper (cypriedium reginae), illegal to pick in Minnesota, takes over a decade to produce it’s first flower. 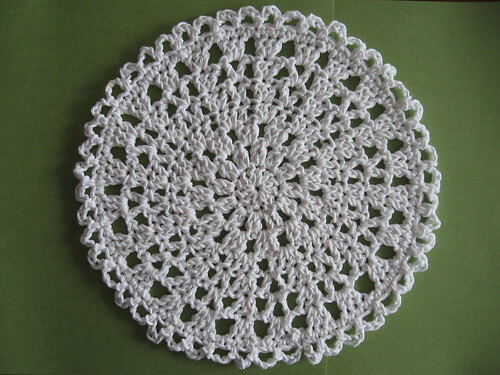 Maybe it’s because I spent so much time restitching the border, but I really do like this Lacy Round Dishcloth. I frogged the last two rounds a few times trying to match the pattern to the picture beofre I gave up and wrote my own border pattern. Round 9: sl st in ch-5 sp, ch 3, 8 dc in same sp, *ch 1, sl st in next sc below in round 7 and around ch 5 of round 8, ch 1, 9 dc in next ch-5 sp, rep from * 6 times more, end ch 1, sl st in next sc below in round 7 and around ch 5 of round 8, ch 1, join rnd with a sl st to top of ch 3. Round 10: ch 1, sc in same st, *[ch 3, sc in next st] eight times, sl st in ch-1 sp, sl st in next ch-1 sp, sc in next dc, rep from * 7 times more, end [ch 3, sc in next st] eight times, sl st in ch-1 sp, sl st in next ch-1 sp, join with a sl st to sc. Also, if you’re past the ‘beginner’ stage of crocheting, it’s not impossible to come up with your own guess-timation for the border rounds. 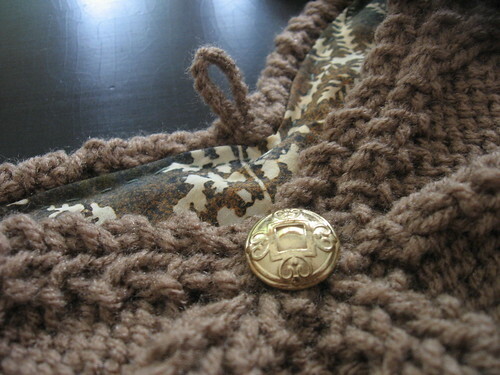 The extra work was well worth the final product though and the border reminds me of Lion Brand’s Sweet Scallops Shawl. 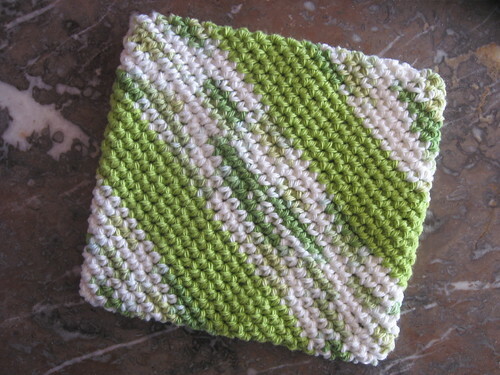 This Textured Stripes Dishcloth is one of the most durable, functional dishcloth patterns I’ve crocheted. 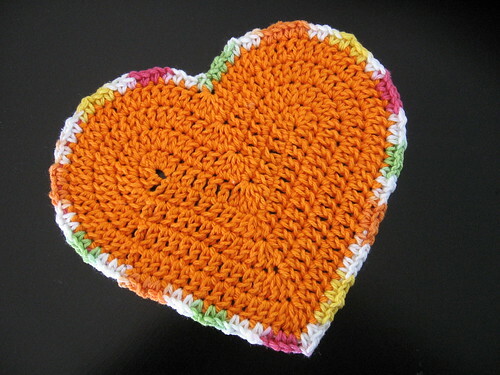 The crunch stitch rows make this dishcloth very sturdy and the size is big enough to get a grip without being overly large. The only downside to the crunch stitch is the difference in gauge compared to single crochet. 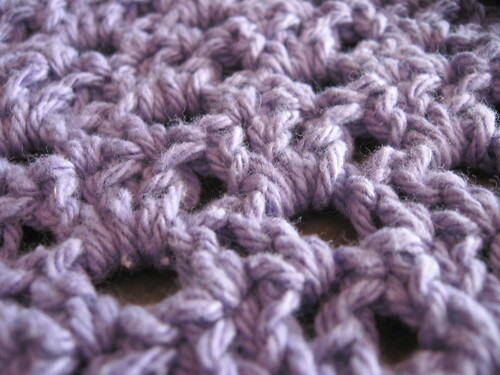 The crunch stitches are very compact and single crochet is comparably loose, making the two of the edges curve. 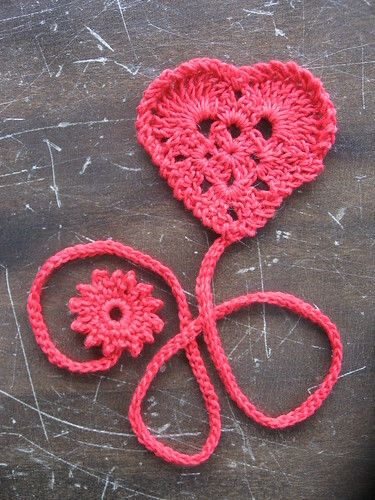 I used a crochet hook two sizes smaller for the single crochet rows, but I could have gone down another hook size. You can see in the picture below that I accidentally crocheted the border facing the wrong side. Oops! Next time I’ll pay closer attention to which side I’m on. 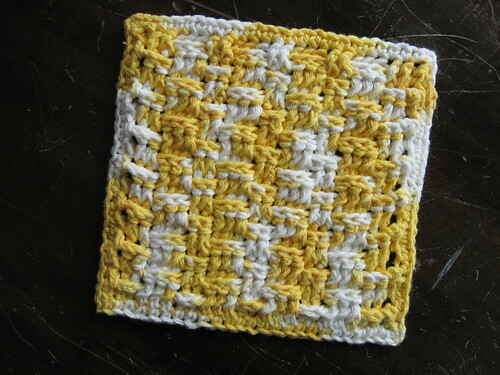 Overall, this pattern makes a great little dishcloth. I’d love to see a matching Swiffer cover. 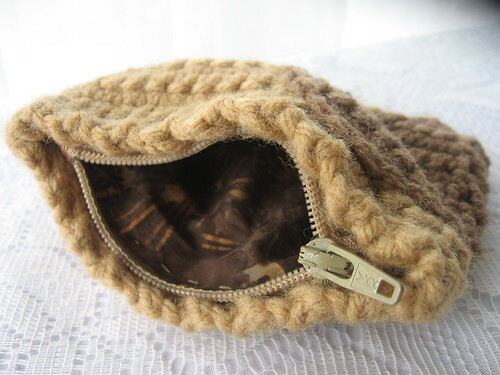 The crunch stitches would be perfect for catching dust bunnies. 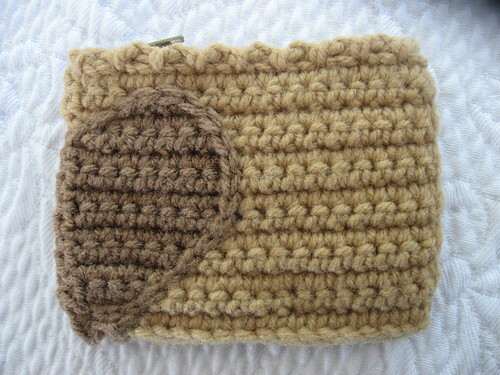 If you don’t like, use or enjoy crocheting dishcloths, but still want to try the crunch stitch, check out the Pirate Clutch on Craftster. 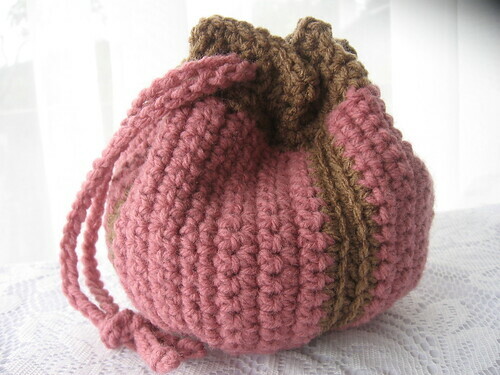 It’s an easy crochet purse with a shell detail. 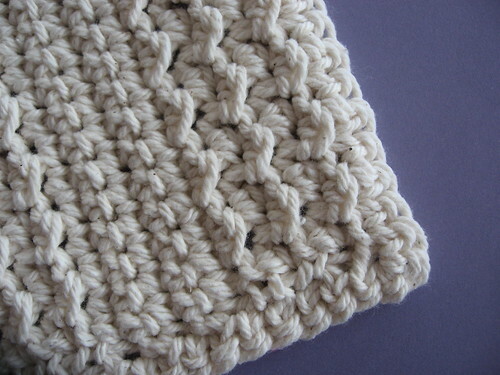 Finally, the Simple Dishcloth uses v-stitches and shells in the round. 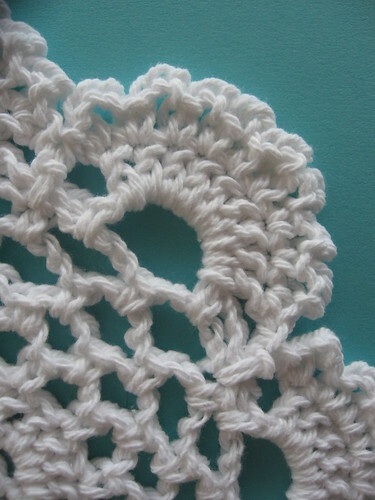 This pattern really is easy and the resulting lacy dishcloth is very pretty. 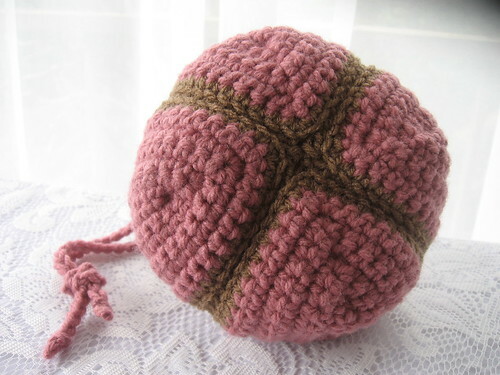 I would use a smaller crochet hook next time because the stitches are not as solid as I expected. Also, I’d like to try using stripes of different colors. The first three rounds would be perfect for a flower and leaf color. Watch out for my next post! Katrina got my swap package, so I’ve got the go ahead to blog about all the crochet goodies I sent her. Check out her blog, Sewalicious Designs for a sneak peak of her Swap Swap Gals package.